This information is found in the comprehensive book on the legends and history of the Catalina Mountains– "Treasures of the Santa Catalina Mountains." Read sample pages and download free PDF of the book! 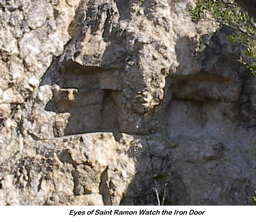 The legend of the lost Iron Door Mine of the Santa Catalina Mountains, north of Tucson, Arizona, is one of those stories that may have some base in fact and history. While buried treasure in the Santa Catalinas have been told for generations, there have been no archaelogical excavations in the area beyond a small acerage to disprove the legends. But, there have been pieces of evidence and documentation to point to some possibilities that could have spawned the lost Iron Door mine legend. During the late 1880s through the 1930s, countless newspaper articles in the Arizona newspapers publish stories of people who claim to have found either a lost city, the lost mine or other great treasures in the Santa Catalinas. Included in this report are links to the those articles. But, the exact location of either the lost city or lost mine with the Iron Doorhas never been fully disclosed or documented. Either they have never been found, the secret has been taken to the grave, or passed on by word of mouth. Maybe a few might still know of its actual location. Claims of secret mining operations, a lost civilization that once inhabited the great Cañada del Oro basin, the gold rush of the 1800s and the famous Mine with the Iron Door book and movie still spur the imagination. The real hidden treasure may have already been discovered and carted off. But some remnants of this "rich mine" in the Catalinas may still be buried away. Some of the naturally occuring gold deposits may still be undiscovered. Today's technology can define once and for all whether the legends have any substance using metal detectors, ground penetrating radar, re-exploration of the area to unravel the mystery. There are actually two mysteries. The legend of the Lost City in the Santa Catalinas is in a different location from the lost mine, made famous during the 1920s as the Iron Door Mine. This page examines the Lost Mine legend. Some of legends name an Escalante who was an associate of Father Eusebio Kino, the missionary who founded Jesuit missions from Mexico through Arizona and California. This time period is about 1702. The legend says that the mine was located deep within the Santa Catarina mountains somewhere along the Cañada del Oro. Escalante worked this mine using the local natives as slaves in the mines. There was some type of settlement, a city, nearby that sustained the workers and also served as a mission. This may be the long, lost city of the Catalinas. The mine produced vast quantities of gold- much of which was taken to Spain. When the Jesuits were expelled in 1767, they left behind their riches. The bars of gold were hidden behind an "iron door." Thus, the Mine with the Iron Door. After more than one undred years, the mine became lost in memory, except for a few remembrances and newspaper articles to keep the legend alive. Read about the rediscovery of gold bearing quartz in the Catalinas that re-energized the hunt for the Lost Mine during the 1880's. Read sample sections from the new book Treasures of the Santa Catalinas: Unraveling the History and Legends of the Iron Door Mine, Lost City and Lost Mission by Robert E. Zucker. 1. "Mineral Appraisal of Coronado National Forest, Part 5." U.S. Department of the Interior, Bureau ofMines, MLA 25-94, 1994. Funded by a program between U.S. Bureau of Mines, U.S. Geological Survey, and the U.S. Forest Service to assist the Forest Service in incorporating mineral resource data in forest plans as specified by the National Forest Management Act (1976). USBM_MIA_025-094. 177 pages. 3. "Lost Mines of the Great Southwest, Including Stories of Hidden Treasures," by John D. Mitchell and "Lost Mine WIth the Iron Door," in Desert Magazine, July 1952. © 2007-2018 AZentertain.com. All rights reserved. Entertainment Magazine network. BZB Publishing, Inc.